Here is a quickly edited presentation of highlights from my recently concluded trip down to Arizona for spring training. If you are a real glutton for travel photos, I've uploaded the full set which you can see by following this link. I'm heading into the kitchen to work on what I hope is a stunning spring vegetable pasta. I should have it up tomorrow. Enjoy! I'm back! After our extra day in beautiful Flagstaff, we boarded the train for a fairly smooth 24 hour ride to northern California. Those of you that commented about how if you're going to be stranded, Flagstaff is not a bad place, were right on. I'm a big fan of Flagstaff. I will be posting lots of photos soon, from the trip and the town, along with a couple very short, very random video clips I shot with my regular camera. 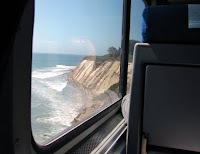 The trip from Flagstaff to LA was mostly in the dark, but the trip up north on the famous Coast Starlight was amazing. 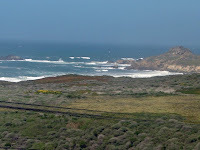 The tracks run right along the ocean, and the views are incredible! I'd like to thank all the characters we met along the way for making the trip so memorable. A special thanks goes out to Joe T. for his role in making this trip work, and to his brother and sister-in-law for the great meal they did for us in Mesa, AZ. Most of all, I huge thanks to Al for making this trip possible, and so enjoyable. From the train trip, to the ballgames and food, to saving our butts with a hotel room in Flagstaff, Al went above and beyond the call of duty. You could not ask for a more better travel companion! Thanks Al! Alright, maybe it's a little funny. 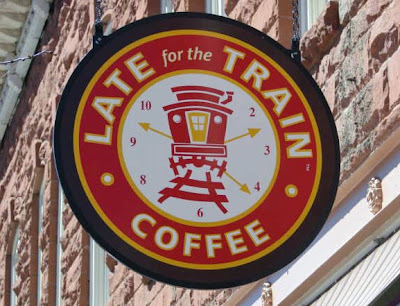 Yes, the coffee shop across the street from the hotel is called, "Late for the Train." Ouch. We decided to spend the night in Flagstaff. If we took the train, that didn't even arrive until 1 AM, we would have had no connection options to Northern California. We hope we can get the original train on-time tonight and make our 10:15 AM connection in LA tomorrow. The today's train is running late again, but not as badly. It's going to be close. Here is a slide show of our dinner and hotel. If you roll over the photo a caption will pop up. For music, click on the little speaker icon in the upper-left corner of the slide show. Enjoy, and wish us luck! Our train is stuck in snow somewhere and isn't due to arrive until 12:35 AM! The horror. If any of you foodwishers has any hook-ups in Flagstaff, email ASAP. I'm in at the Downtown Dinner. I have one more day down here in sunny Arizona, and then it'll be back to cool, breezy San Francisco. I can't wait to see my wife, my kitchen, and my equipment (definitely in that order). This video for "Condiment Chicken" was named in honor of the few basic, but crucial ingredients I found at the ballpark, which made all the difference with this simple grilled recipe. One of the best cooking-on-the-road-with-no-stuff tricks ever, is the salad dressing triple play. 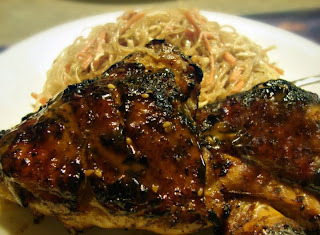 It's our marinade, noodle salad dressing, and chicken glaze. Spiked with some pilfered hot pepper, ketchup and mustard it was more than delicious. Anyway, no time for a long, thoughtful post. It's late, and I have to shut it down for tonight - we are leaving early for a game in Scottsdale, then driving north to Flagstaff (any dinner recommendations are welcomed), then it's on the train for an overnight ride to LA, then on to San Francisco, arriving Saturday night. Since I filmed two recipes, I don't feel too guilty, but I haven’t really been taking many pictures. I will post those I did take when I get back - the train station in LA is really beautiful and I got a few great shots. Enjoy! I just found out I've been assigned to interview Wolfgang Puck for About.com. Of course, as Murphy's Law would have it (what's Austrian for Murphy? ), this comes along while I'm traveling, with time and creativity being in shorter supply. So, I was wondering if you help me out by submitting a question or two that I could use for the interview. Any and all serious ideas are appreciated. I need to submit between 10 and 15 questions to my editors ASAP. 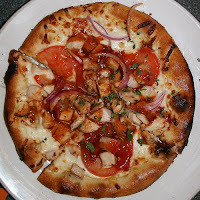 Chef Puck's famous California pizza (pictured here) will be the topic of a few of the questions, but I need more. Thanks! The good news about staying in one of these timeshare hotel suites is they usually have full kitchens. The bad news is they don't have any supplies or pantry with which to work, so planning a nice meal can be a bit challenging. 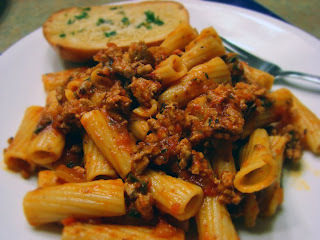 This Timeshare Turkey Bolognese video recipe is a good option since it doesn't require many ingredients, or a whole lot of slicing and dicing. Every one of these types of kitchens has the same exact knife set - flimsy, jagged-edged, plastic-handled, Ginsu-wannabes. These knifes are not only dangerous to use, but make even the most basic cuts virtually impossible. You'll actually see me resort to a pair of scissors to cut the parsley. 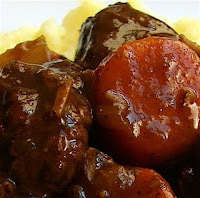 This recipe was nice because even the most poorly chopped onions and garlic will still work in this sauce. Keep in mind as you prepare to comment, this is not my usually Bolognese sauce - so questions about why I didn’t add something, etc., will all get the same answer - I'm cooking on the road. I may (for a nominal fee) be making that much sought-after video recipe available soon, but for now this very crude version will have to do. All in all, it was a great tasting meal, and my two customers seemed very happy with it. I hope those of you with access to fully stocked kitchens and pantries will take this very basic recipe and run wild with it. Enjoy! Tech note: This was filmed without my usual studio equipment, so the audio is pretty rough. Just before leaving for Arizona, I covered the 3rd Annual San Francisco International Chocolate Salon for Foodbuzz.com. Here is my report, enjoy! 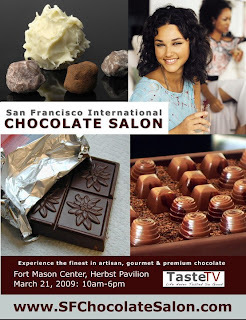 As I stood in line at the Herbst Pavilion, Fort Mason, San Francisco, waiting to pick-up my pass for the 3rd Annual San Francisco International Chocolate Salon, I noticed that everyone seemed to be wearing the same happy expression. I've decided to call it chocolate face. Unfortunately, chocolate face can't be captured on film - if you stop someone to pose for a picture the expression changes. It isn't something that should be saved anyway, chocolate face is simply there to be observed and enjoyed, like a Tibetan sand painting (or in this case an organic Venezuelan cocoa painting). Anyway, once inside I worked my way around the room - tasting, drinking, smelling, and proudly displaying my own chocolate face. Here are some highlights, as well as a couple low-lights. Best in Show goes to Amano Chocolate. 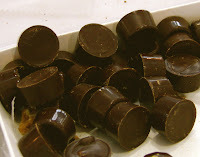 This is the chocolate I just used in the dark chocolate coins video. It was simply the best chocolate in the room. I tasted dozens of premium chocolates, all very good, but there was nothing that compared to Am ano's deep, rich, complex taste - the holy trinity of chocolate flavor; floral, sweet, and bitter, all in perfect balance. One of Amano's chocolate makers, Clark Goble, gave me a sample of a yet to be release variety called Montanya (pictured here in temporary packaging) that uses cacao beans so remote they can only be reached by horseback. It was exceptional, but my favorite is still their Jembrana. The next two standouts were in liquid form. 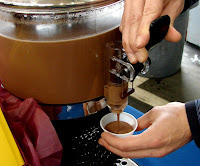 Schoggi was pouring a hot chocolate that not only had great flavor, but more importantly had the perfect viscosity. 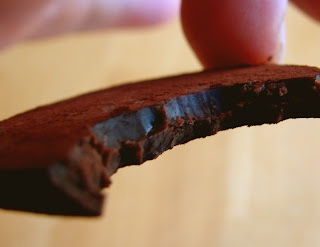 No matter how good the chocolate used, if a hot cocoa is too thick, or too thin, the flavors will not finish fully when swallowed. This was absolutely spot on. Then there was something called Choffy, and although the name's a little on the nose, this hot drink made from roasted cacao beans, brewed like coffee, was very enjoyable. Pleasantly bitter, and strangely calming. Choffy would be great in the morning with a freshly baked Muffish (a combination muffin-Danish). Dolce Bella got my vote for best filled chocolate with their take on the classic Rolo (my description, not theirs). Crisp dark chocolate filled with perfect caramel. Sorry peanut butter, but there's nothing better. 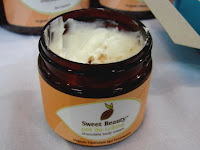 Sweet Beauty featured chocolate as make-up and spa treatments. Chocolate lipstick, body rubs, body scrubs, and other edible applications. I liked the packaging and presentation, but I just couldn't bring myself to dip in. I'm no germaphobe, but I wasn't clear on what was being tasted and what was being rubbed on body parts. I like chocolate, and I like edamame, but I don't like chocolate-covered edamame. I don't blame Jade though; there is something in our human DNA that drives us to chocolate-cover every possible thing. Xocai wasn't one of my favorites. Which is completely unfair since I didn't taste it. I just couldn’t get past all the fitness buzzwords. They also lost me with the cedilla (that little thingy under the C). Are we out of all the chocolate company names that don't require diacritical punctuation marks? 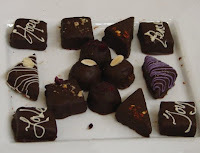 Worst in Show was this plate of chocolates from a local catering company (to remain unnamed) who had set up a table to promote their business. That's all fine, but in a room of such amazingly made, stunningly perfect, brilliantly shiny, geometrically correct chocolate (pictured below), you just can't put out a plate this imperfect and not look like complete amateurs by comparison. Context is everything; if you put this same chocolate out at a chicken wing tasting it kills. Overall, the Chocolate Salon was well organized, and smoothly run. The room was busy, but not crowded, and I didn't overhear even one complaint, which is rare for these types of events. Slow Food Nation may have spoiled me, but I thought the interior of the Herbst Pavilion could have used a little dressing up. Next year I suggest getting some trees in there, and maybe a fountain with some dry ice for that misty rainforest ambiance. If you attended this event, please leave a comment - I would love to hear your thoughts, and see if we shared similar opinions. Thanks! Chew Choo - Foodwishes is Taking the Train to Spring Training! I am very excited to announce that I will be leaving Sunday morning for Arizona's Valley of the Sun. 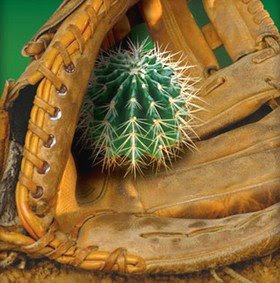 My father-in-law Al and his buddy Joe are heading down to take in some Cactus League spring training baseball (and NCAA basketball if the sports Gods are smiling upon them), and they've retained my services as personal chef, bodyguard, and wingman. As exciting as it is getting the chance to watch my beloved San Francisco Giants prepare for another heartbreaking season, the thing I'm most pumped for is the train ride. 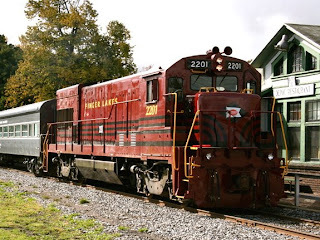 My father worked for the Lehigh Valley Railroad and trains have always held a certain romance for me. There's a very good chance that the train pictured here (you can see the "Finger Lakes" on the side of the engine), was probably piloted by my father John at some point (like 40 years ago). He actually met my mother Pauline while traveling along the route through western New York, one of the stops being in her hometown of Manchester. Well, enough of the family history, I just wanted to give you all a heads-up in case you don't see any new posts for a few days, and/or I don't reply to your comments or emails in my usual timely manner. I'm told the hotel rooms where we're staying have full kitchens, so you very well may see me work my magic from the road. Hey, if I can make a toasted cheese sandwich with an iron in Vegas, I should be able to film at least one meal there. Stay tuned! There are many theories floating around these days about what signs will accurately indicate a turn-around in the economy; things like housing starts, interest rates, and commodity futures. But, I'm going with the O.R.C.I., the onion ring consumption index. My theory has it that the higher the frequency of onion rings ordered, the better the economy is doing - and more importantly, the better people are feeling. You just don't order onion rings any old time, mainly because they're a side dish you have to pay extra for. You have to take a moment for some self-negotiation before ordering onion rings. In those few seconds of contemplation, much is revealed. Can you afford it? Does your current mood and situation warrant this crisp indulgence? Onion rings are also ordered when good things have happened; you order them after you get a raise, after a hole-in-one, after a new high bowling score. Happy people spend more money. I will continue to monitor the national O.R.C.I. for you, and will be sure to let you know when these tough times are over, but until then here's a video recipe for making onion rings at home. I don't really deep-fry at home, and neither do most people, so when I find a recipe that does a reasonably good job at producing something close, I jump on it quick. 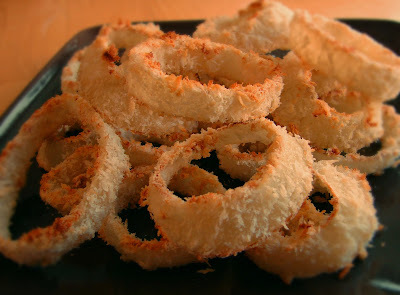 This onion recipe is easy, low-fat, and if you use the recommended Panko breadcrumbs, produces a light and crisp onion ring. Enjoy! This weekend's filler video stars my lovely and talented niece Alexandra, performing a perfect 10 routine at a recent gymnastics meet. The secrets to her success? Extremely dedicated parents and grandmother who nurture her talents; thousands of hours of grueling practice; and most importantly, a diet very high in carbs. Speaking of high carb diets, after Ali's video I've posted a fun little pasta making/Olympic tribute video I did last year. By the way, she's in the foreground and her routine doesn't start immediately, but be patient, it's worth the wait! 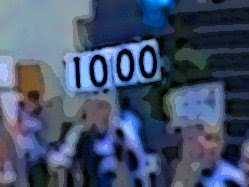 After she becomes a famous Olympian, you can say, "I remember watching her on her uncle's food blog a few years ago." Enjoy! 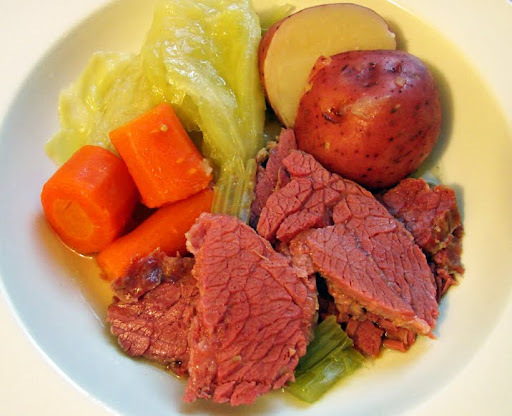 It's almost St. Patrick's Day, and for many that means boiling up a nice authentic Irish dinner of corned beef and cabbage. The funny thing is, it's not that Irish. How it came to be such an icon of Irish-American cuisine is not completely clear, but it goes a little something like this. When Irish immigrants, fleeing the great potato famines, arrived in the Northeast they couldn’t find, or afford, the traditional cuts of meat used for their beloved braised dinner. The original Irish recipe actually used a type of lean bacon, made with a cut of pork similar to Canadian bacon. 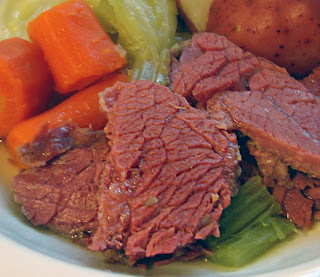 Corned beef came into the picture as a lower-cost substitution, to replace the more expensive and harder to find cut. But, why corned beef? New York's early immigrant populations lived in very crowded neighborhoods, and there was a close proximity between the Irish and Jewish communities. If there is one thing that history has taught us (besides, do unto others as you would have them do unto you), it's two ethnic groups living close to each other will always borrow from each other's culinary traditions. 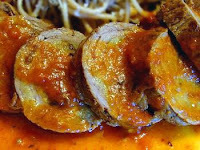 This is a common theme in many of the world's greatest recipes - the just posted Pork al Pastor was a perfect example. By the way, I make a couple drinking jokes in the video, but I feel entitled since many of my closest friends and relatives have very deep Irish roots, and it's all meant in good fun. I actually think it's terribly unfair that so many people believe the stereotype that all Irish people are heavy drinkers. It's just not true - I know hundreds of Irish folks, and several of them don't have a drinking problem. Enjoy! 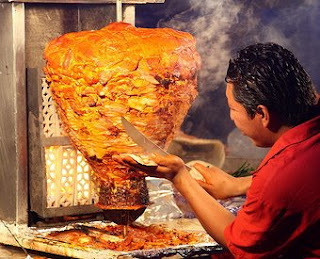 My all-time favorite fast food in the whole world is a Taco al Pastor. I live right next to the "Mission," which is San Francisco's Mexican neighborhood, and there are literally three or four taquerías per block selling this amazing treat. It's a huge stack of thinly sliced pork, marinated in chili, pineapple juice, and other secret ingredients, piled up on a vertical spit and cooked rotisserie-style. The tender, aromatic meat is then sliced off and served on tortillas, usually with onions, cilantro, and a little hot sauce. It's too good to describe. 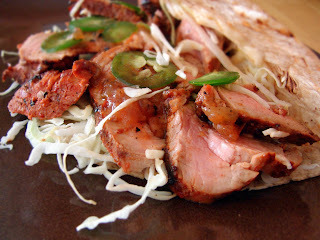 This pork recipe is NOT a true al pastor (fyi: shepherd-style), but simply a nice, easy marinade using some of the same ingredients to fairly delicious results. The main ingredient is the pineapple juice, which not only gives the meat a great flavor, but also has enzymes that makes it very tender. 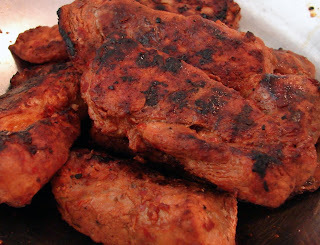 Of course, I decided to use some pork tenderloin I had, which sort of defeats the purpose, but this marinade really pays dividends when using the much cheaper, and more traditional pork shoulder. One of the key spices is cinnamon, which is no surprise since the origins of this recipe trace back to Lebanese immigrants living in Mexico City, where they were clearly showing off their shawarma-rich heritage. Lamb shawarma is a similar preparation, and you can watch me do a faux-version of that here. 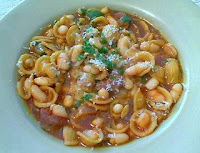 This is one of those recipe that I just happened to have the camera on as I cooked. I didn't measure things, I forgot to film the cinnamon addition, and never even added cumin, another traditional spice. 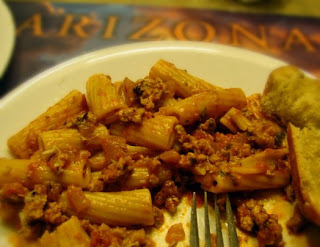 Nevertheless, it was wonderfully tender and tasty, and I'm happy to share it with you, flaws and all. Enjoy! Note: Vimeo is still having sound issues, sorry. UPDATE: We have a winner! 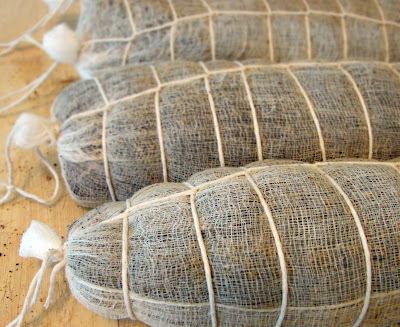 On March 10, 2009, at 6:08 PM, Pyrofish submits Bresaola. Congratulations! If it turns out, I may mail you some...as long as you sign the waiver. Inspired by Clara and her depression-era pasta and peas, I decided to do my own take on this meager macaroni. I hope I'm wrong, but I think the next big thing in the food world is going to be these types of "frugal fabulous" recipes. 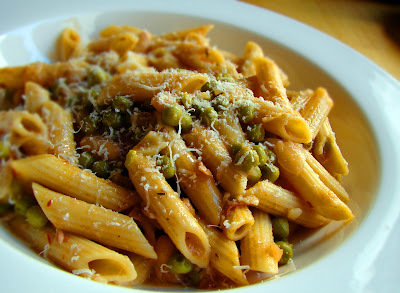 During this video recipe for penne pasta with peas and prosciutto you're going to see a few of the classic strategies for stretching those dwindling dollars. There's the pasta and beans (get used to seeing those), as well as the see-through width slice of meat (you could read the paper through it, if you could afford the paper). The hardest part about making this video was resisting the temptation to make the recipe better, but I really wanted to stay true to the mission of achieving maximum flavor and satisfaction, with a minimum of cost and ingredients. The result was a delicious, filling, cheap, and soulful bowl of food. Enjoy! Note: Vimeo is still having sound issues. Welcome to Depression Cooking with Clara. Clara is 91 years old, and since she experienced the Great Depression first hand, she's decided to show the country how to cook her favorite childhood meals, you know, just in case. With the state of the economy such as it is, and fears of another depression looming, you would think these videos would be rather disturbing, but they're not. As she cooks the food that kept her and her family going, Clara shares her memories of those very hard years, but she does it with a twinkle in her eyes that leaves me optimistic. Enjoy. I don't know how I missed it, but there it was, sitting at the bottom of the white plastic bin where I store my potatoes and onions…a single russet. A single potato is never a good thing. Do you wait to buy more, and hope it blends in? Do you waste all that gas and heat, cooking one single potato? One of the few practical uses for these rogue spuds is to make a small batch of potato gnocchi. Let me disclose right up front that I really don't like gnocchi that much. They're "Aight" as Randy Jackson might say, but I never go out of my way to eat them. However, I love to make them. This is an interesting recipe to make, and just about the most fun thing you can do with a single potato (assuming you lost your Mr. Potatohead parts long ago). 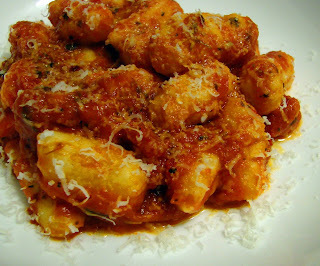 There is no such thing as an exact recipe for gnocchi. If you don’t like cooking by feel, and need exact measurements before attempting to cook something, this recipe is not for you. Potato sizes vary, the starch/water contents vary, how you cook it, and how much flour you add not only depends on the aforementioned factors, but also on the desired texture/density of the gnocchi. 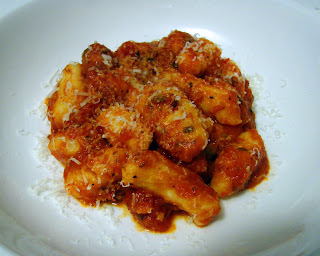 I like a very potato'y gnocchi, so I go with just enough flour to form the dough. Other people prefer a denser, more pasta-like dumpling, and use much more flour. I know many of you hate it when I say this, but you'll just have to figure it out as you go. The good news is, figuring things out in the kitchen is fun. Enjoy! Tech Note: I'm having a sound issue with the videos in Vimeo with the Mozo pre-roll at the beginning. I'll continue to work on it, but until I figure it out here is a low-res YouTube version to hold you over. 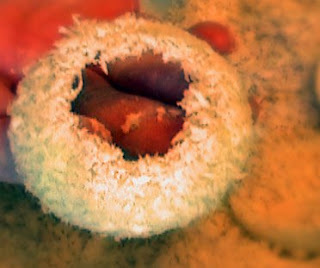 Here is the Vimeo version, and you can hear the sound distortion problem. They are working on this issue, and hopefully it will be fixed soon. 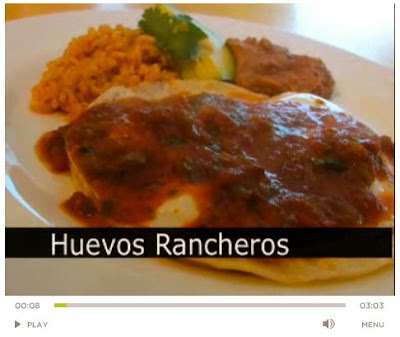 I was very excited when I saw Huevos Rancheros on my assignment list for About.com. It's one of those breakfast recipes that I love, but never remember to make. 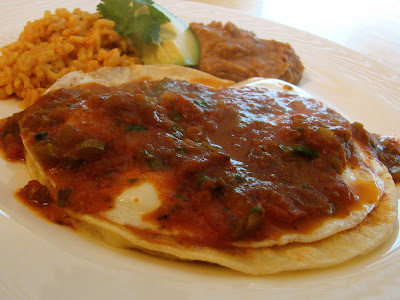 Huevos Rancheros simple means ranch-style eggs, and if you've ever worked on a ranch, like I have (I picked corn one summer), you understand the importance of a hearty breakfast. There are many variations of this dish, all which includes some kind of eggs topped with some kind of tomato and chili-based sauce. 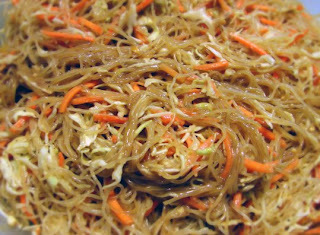 This video recipe shows a fairly traditional preparation with two slight twists. I like my ranchero sauce kind of smooth - where as most classic versions are quite chunky. Also, instead of the plain tortilla base, I slip in a slice of cheese for a little quesadilla action. If you decide to go ahead and try this (and when you see the money shot at the end, you really won't have much choice), you should follow my lead and have it with the rice and beans. I love homefries the much as the next ranch hand, but there's something about the way the egg yolk and ranchero sauce mix together that works so well with frijoles refritos and arroz. Since this recipe was produced for About, the following video link will take you off the site to watch the video, just don’t forget to come back. Enjoy! 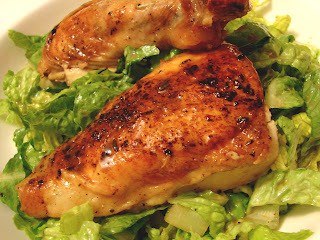 This very simple, roasted chicken video recipe is an example of how appearances can be very misleading in the kitchen. The sauce is built from the caramelized lemon and chicken juices stuck to the bottom of the roasting pan, which take the form of an unappetizing black tar. If you didn't know any better, your instincts would tell you to discard the darkest bits before making the "jus." That would be a big mistake. 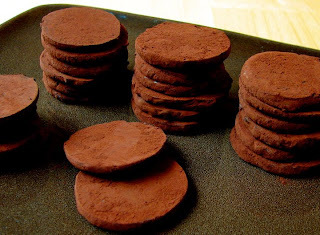 While it looks like it would taste like a charcoal briquette, it actually tastes like….taste. To borrow the catch phrase from a currently running soup commercial, "I like the taste of taste." As many of you already know, there are four primary tastes, salty, sour, bitter, and sweet. If you take a small bit of the black tar from the bottom of the roasting pan, and pop it in your mouth, instead the one-dimensional burnt flavor you may expect, you should get an intense, very intense, combination of all four tastes. I'm not sure why this is, but when we dissolve this super four-taste-tar with some additional stock, it makes a great dressing/sauce with which to finish the dish. 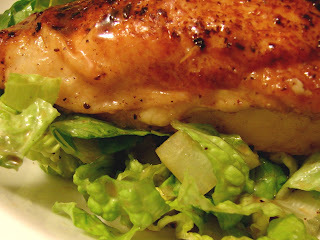 As you'll see, I used romaine, but this same recipe works great with watercress, arugula, or spinach. Also, don't be afraid of a little bit of chicken fat. Think of this sauce as a warm dressing - in fact, this probably has less fat than if you just ate the dry chicken on a fully dressed salad. Enjoy! I'm in the middle of doing my taxes, and while making so little money does make it fairly straightforward, there is still a lot of paperwork to get through. 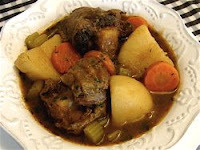 So, since it is pouring rain in San Francisco today, I thought I would link to six great stew recipes, all perfect for days like this. I hope to be back with a new video tomorrow, so until then you'll just have to sit and stew.